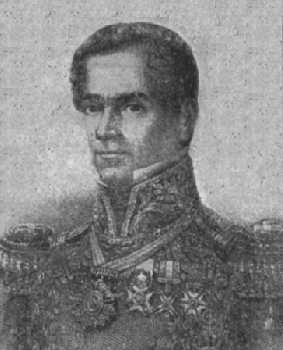 Antonio Lopez de Santa Anna, the leading villain of Texas history, was born in Mexico on 21 February 1794. As a young military officer, he supported Emperor Agustin de Iturbide, and at one time courted the emperor's sister. He later rebelled against the government, gained considerable backing. By 1833, he was elevated to president of Mexico in a democratic election. He soon determined, however, that Mexico was not ready for democracy and pronounced himself dictator. Santa Anna was remembered as a particularly ruthless opponent by the Texans. Despite this, he was allowed to return to Mexico after his capture at the Battle of San Jacinto. After his return to Mexico, Santa Anna participated in the Mexican War and in 1853 sold territory to the United States including that area known as the Gadsden Purchase. He was later exiled from Mexico, but allowed to return a few years before his death in 1876.